Ossip Zadkine was born in Vitebsk into a Jewish family of Scottish ancestry and spent his childhood in Smolensk. His father taught Greek and Latin. He grew up in a land of forests, which explains his attraction for wood, the essential material of his work. Zadkine developed a passion for art from a very young age, although his family did not encourage him. He dreamed of becoming a musician but his father was vehemently against it and broke his violin. In 1898, he drew the portrait of a Cossack while his father was playing with his friends in the same room. They all stopped at once to watch the young Ossip draw. From this day on, he drew constantly and produced numerous family portraits. In 1902, Zadkine accidently fell in a river and discovered that he had slipped on white clay. From this day, he relentlessly worked the clay, to his father’s utter despair. In 1905, the latter sent him to his cousins England. They did not speak Russian, so Zadkine learnt English. He studied art in Sunderland. In 1906, he left his cousins and moved to London, where he enrolled in an art school and earned his living working small jobs for furniture makers. He visited the British Museum and studied classical sculpture. He returned to Smolensk in 1908 and produced his first sculpture. The following year, he went back to Russia. His father finally accepted his son’s artistic orientation and advised him to study in Paris. In 1909, Zadkine arrived in Paris. He studied at the Ecole des Beaux-Arts and lived at La Ruche, where people called him Joe Zadkine. In 1910, he traveled to Smolensk for the last time. During this trip, he met Chagall in Vitebsk. In 1911, his statues and drawings were exhibited at the Salon d’Automne and Salon des Indépendants. He joined the Cubist movement and spent time with Russian students in the Latin Quarter. In 1912, he lived in rue de Vaugirard in Montparnasse and studied Roman sculpture. He made friends with the avant-garde poet Paul Eluard, photographer Man Ray, and composer Erik Satie. They were members of the commission that brought about the scission of the Dada movement. In 1914, thanks to the support of the collector Paul Rodocanachi, he opened a studio in rue Rousselet. In 1919, he published poems in Pierre Albert-Birot’s journal. He first developed a passion for Cubism, but later broke away from it. During World War I, Zadkine was a stretcher bearer and produced drawing and watercolors depicting the war. He affirmed that the war had destroyed him physically and spiritually. He continued to represent it throughout his life. In 1920, Zadkine organized an exhibition at his studio, which only his friends from La Rotonde café saw. That same year, he married the painter Valentine Prax. Foujita and his wife Fernande Barrey were witnesses at their wedding. In 1921, the first monograph on his work was published. That same year, he acquired French nationality and the Grenoble museum bought one of his works; this was the first time that a French museum acquired one of his sculptures. Zadkine painted numerous watercolors and gouaches and sculpted wood and stone statues. In 1923, he moved to 100 rue d’Assas, where he lived until his death, and which later became the Zadkine museum. He exhibited his work in Tokyo in 1924 and in Brussels in 1925. He sold little and refused to be attached to a dealer. He earned his living teaching sculpture in Paris. In the 1930s, Zadkine traveled to Italy and the United States. He spent the summers at his house in Les Arques. His work was exhibited at the Petit Palais and at the Musée d’Art Moderne in Paris. In 1933, Center for Fine Arts in Brussels organized his first solo exhibition. He visited New York for the first time in 1937, where he attended the opening of his solo exhibition at the Brummer Gallery. In 1938, he participated in the Venice Biennale. In 1941, Zadkine left Europe for the United States. He worked in New York and exhibited his work at the Pierre Matisse gallery alongside other artists in exile. Back in Paris in 1945, he taught sculpture at the Académie de la Grande Chaumière and brought back the works that he had produced in America. In the last years of his life, he produced numerous works. In 1964, Ionel Jianou published his catalogue raisonné. 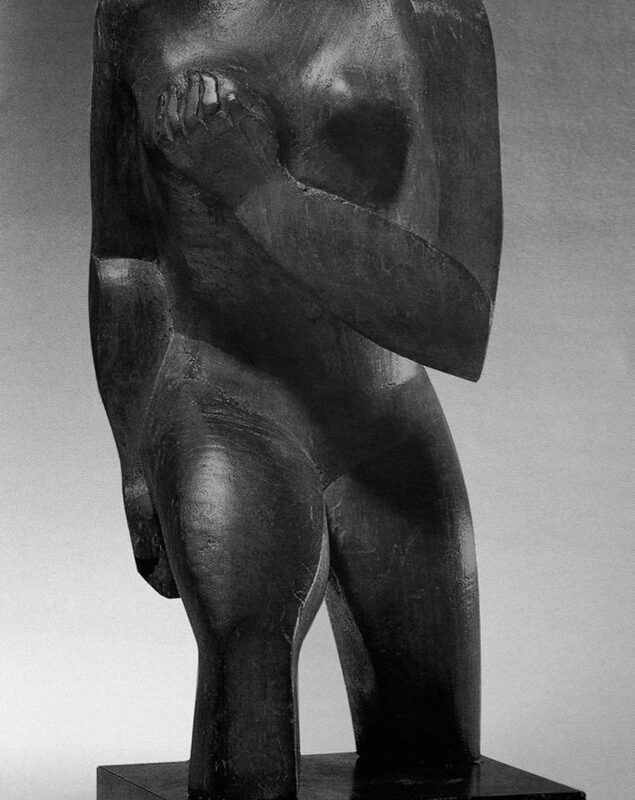 Ossip Zadkine died in 1967 in Paris. He was buried in the Montparnasse cemetery.